HSL 102 was ordered under contract CP8A/23424/36 and built by British Power Boat as Yard No. 1038. She began her service career at Donibristrle, Scotland where she was taken on charge on the 27th October 1937. The HSL was one of the many craft to be involved with Operation Dynamo rescuing Allied forces from the beaches at Dunkirk and on completion she was returned to the builders at Hythe in July 1940 for modifications. Repairs completed she was allocated to operate from Blyth with No.15 Air Sea Rescue Unit (ASRU) from April 1941. HSL 102 was subsequently transferred to operate from the seaplane base at Felixstowe with No. 26 ASRU from October 1941 and was listed as under repair by 85 Maintenance Unit (MU) located at Felixstowe from December that year. During 1942 the craft was based first at Newhaven with No. 28 ASRU and then returned to operate from Felixstowe once again. During her time as an Air Sea Rescue Launch, she saved the lives of numerous "ditched" pilots from the sea. With the introduction of better craft towards the end of the war, some of the class were transferred to other duties. 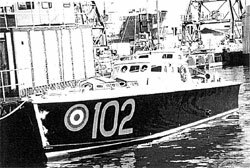 The RAF service of HSL 102 ended on the 4th March 1943 when she was transferred to the Admiralty to become Control and Target Towing Launch No. 12. With a strengthened stem she was employed towing gunnery targets. Post WWII the CT/12 (ex HSL 102) was surplus and like many other craft sold off in April 1946. Little is known about HSL 102 after her sale from the Admiralty until she was spotted as a house boat in Dartmouth in 1993. At that time she was known simply as EXCERVUS and from all accounts had been at Mill Creek for over 10 years. 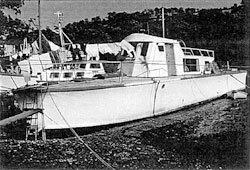 When EXCERVUS was up for sale, Phil Clabburn purchased her and had her towed to Plymouth where she was lifted out and taken by road to the then home of Powerboat Restorations in Fawley, Southampton, the base of National Power PLC who generously provided the space and facilities for her restoration. 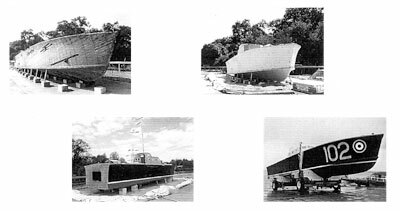 With the old house boat superstructure removed, by July 1994 her hull was being repaired. Over the following months areas of her double diagonal planking were renewed as were her bulkheads, frames and chine. New floor beams were laid and new bearers constructed. 60,000 screws were removed from the hull which, was then re-fastened. A completely new deck was added and a new wheelhouse was built from the original drawings. Once rebuilt, the hull was completely sheathed in grp, and to allow this to continue an "all-weather" Space Station Cover was erected over the whole craft. By April 1996 she emerged almost complete with her new looks which once again resembled her former HSL appearance. She was re-launched in July 1996.